The Canadian Institute in Greece (CIG) - originally the Canadian Archaeological Institute at Athens - is a privately-funded, not-for-profit organization, incorporated in Canada. CIG is officially recognized by the Hellenic Ministry of Culture and Tourism as a foreign archaeological institute, with primary responsibility for Canadian archaeological research in Greece. The Institute promotes research in fields relating to Greece’s heritage - ancient, Byzantine and modern - through its academic programmes, through the provision of accommodation and library facilities in Athens, as well as through the provision of fellowships and internships for Canadian students. 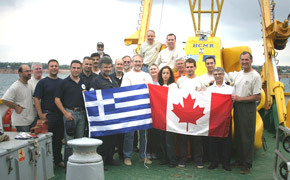 CIG also sponsors Canadian cultural activities in Greece.